Discussion in 'Pentecostal & Assemblies of God' started by quietbloke, Jul 29, 2016. 'Good night campers. See you in the morning'. God bless and keep! O God of grace, that I shall awake. 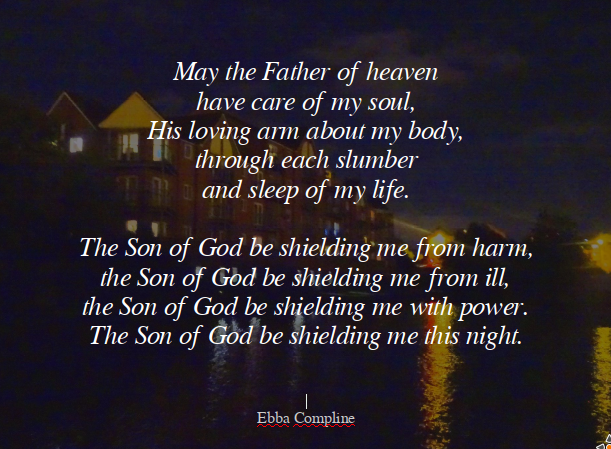 Praying you will all have a good night's rest. God bless. Bless my sister-in-law with her operation tomorrow to remove the tumour. Prayers that the Lord will bless and keep all those who read and share on these forums. Lord we especially bring before you quietbloke with the operation for his pacemaker. We trust that you will ensure that all goes well for him and that he will be comforted by your presence. We ask you to draw close to musicalpilgrim's sister-in-law and that you will ensure the operation tomorrow for her tumour will go smoothly and successfully. Please also draw near to musicalpilgrim this evening and give her your encouragement and peace. I slept through! So good, so grateful to the Lord. Lord we ask that you continue to draw close to and bless all people in this thread. We particularly remember those we know who need our support in prayer at the moment, musicalpilgrim and her sister in law, quietbloke having his surgery. Grant us your rest this night and your strength for the coming days. Our dear ones, O God, bless Thou and keep, in every place where they are. Our dear ones, O God, please Thou and keep, in every place where they are. I am so grateful to be a part of this forum. Good Night dear ones! To all my friends here, wishing you a very blessed evening and a refreshing peaceful sleep. Praying for all our friends. Keep them safe night and day! Dear Father, I bring to you everything I started and haven't finished...the chocolate cake that I dropped on the floor before I had chance to cook it. all brought and laid before you. Love and prayers to all my friends on Christian Forums! May the Lord give you a refreshing night's sleep and thanks for all your encouraging stories, prayers, testimonies and contributions! I'm also praying for my friends this evening at the Society of St Francis who have just finished their night prayers. They have now entered their time of silent prayer and may God bless all the wonderful work that they do. ..the chocolate cake that I dropped on the floor before I had chance to cook it. Whoops! Hope you have a chance to cook another one! Ooh God, clear the heavenly realms and every height under creation. grant Lord ministering spirits to grant now that long-term blanket to sooth this un-necessary depriving of the body's replenishing rest, which is Your temple in Jesus name!